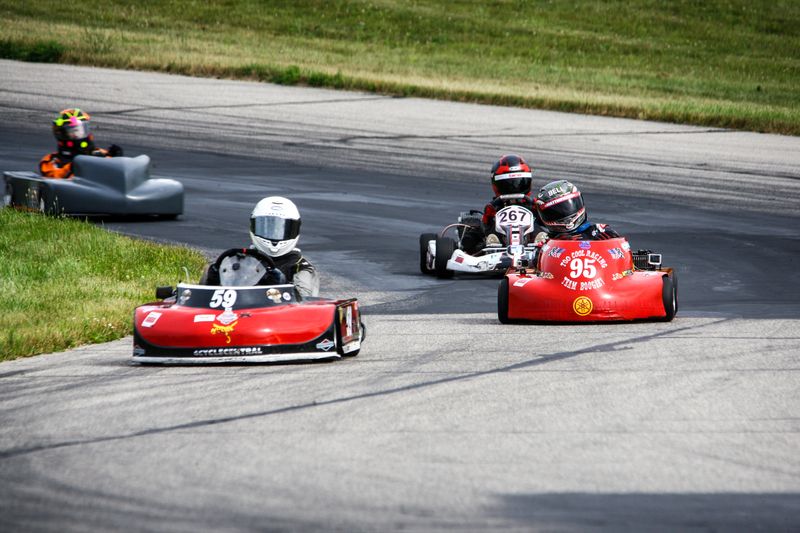 The second three day road racing weekend of our season was held at Grattan Raceway Park. This is probably one of the most difficult tracks with several off camber corners and blind features. Of course being July it was also extremely hot. Though this time we have the trailer AC working again thanks to a borrowed home generator. I got a chance to drive the track on Saturday when it rained and the track needed some car and trucks to dry it off. It was pretty funny having Jason critique my racing line while I was really trying to hit the puddles to air them out. I really have to give these guys credit, running bumper to bumper at 70-90 miles an hour over hills and though steep corners. There is a huge amount of trust between race car and kart drivers knowing that the guy in front and the guy behind is not going to take you out. For the sprint junior class Jason ran both races in his sprint kart in an effort to find parity with the other drivers. On Saturday, I put on the black plate(Dart Rules) but the other kart was super fast and Jason had no chance to catch him. After discussing the issue with the other Dad I took the plate off to run CES rules. Unfortunately, the other kart had technical issues and Jason ran away from the field. This is probably the most frustrating part of the weekend. I would like to see Jason and the other driver race and not blow each other out of the water. It has put a real sour taste in my mouth for the class. Since this is a CES race weekend we put the road kart out with the Animal 370 karts. 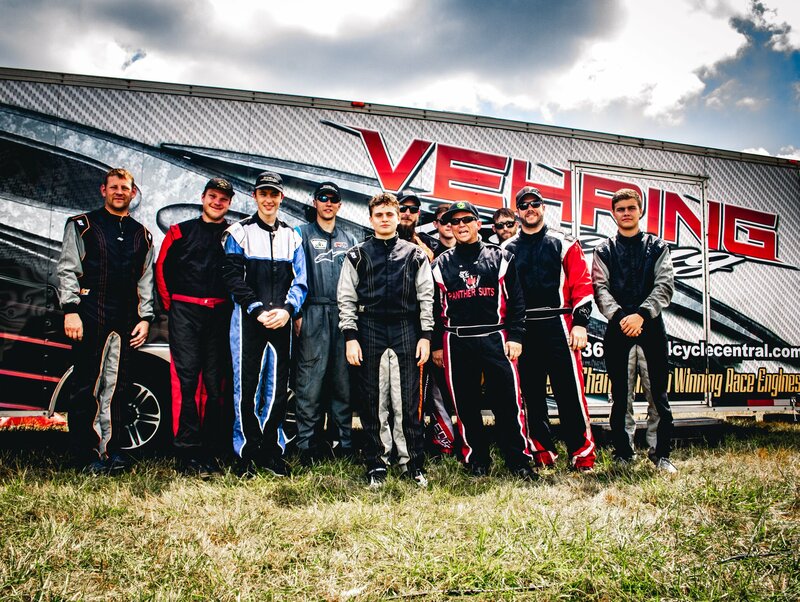 Jason was looking forward to racing at Grattan in his road kart with this group. Friday practice went pretty well Jason was definitely middle of the pack and we made some progress in getting the kart tuned up. As Saturday practice wound down the motor started burping, during race 1 it burped some more and died after a few laps. We though it was a loose plug wire, but during race 2 it completely fell over during first corner. For Sunday, I put a spare motor on and a new set of tires too. However, during the first race the seat struts shifted and Jason pull off a few laps in. After working all afternoon between racing getting the seat sorted he was finally able to race. He did alright, after a great start and only fell back a few spots finishing in the middle of the pack. While we had fun it was not the weekend we had been expecting, we would have liked to been racing more and wrenching less. The weekend was also the 4 Cycle Central Animal Nationals and the racing as always was great, Patrick Olsen put on a stellar performance winning 3 out the 4 races. Jason was the only one in his class but still had a great time racing when he could. He he put in the effort in setting up his kart and driving very hard. Thanks Regan at 4 Cycle Central, Jack at Reall Racing for their setup and motor assistance. The next race is a return to sprint racing at G&J Kartway in Camden Ohio. It is the last race of the Cup Karts of North America central series.